Note to teachers: This episode will be online for preview throughout the month of September. The next episode will start Sunday, October 7, 2018, with new episodes weekly through the end of April 2019. Today was another amazing Uncle GT day! Geo and I got a letter from our Uncle Globetracker (we call him Uncle GT) in Washington, D.C. He always gives us such interesting gifts. But today's topped all of our expectations. Geo and I are being sent on a top-secret mission - and our first stop is NEW YORK CITY!! Our missions for Uncle GT are the most exciting trips ever! How are my favorite niece and nephew? Your Uncle Globetracker has a new assignment for you two. If you are interested, I need you to report to New York City tomorrow morning. Your instructions will be waiting for you in the observatory (on the 86th floor) at the Empire State Building. Look for the purple folder. You will have an excellent view of the city at 1050 feet above the ground. Please do not tell anyone about this mission (especially little Pandora - we know how hard it is for her to keep a secret). Don't worry; I have already talked to your high school and parents. The school has given you permission to study under my supervision for a while, especially since you are so far ahead with your work. However, the school is requiring you to keep a detailed journal of the journey. The journal must include pictures from the places that you visit. So start keeping accurate records immediately. You will be under my care and protection throughout this journey. They are all aware that you may be gone for a week, month, or even longer. The government really needs your help. Get ready for a unique adventure. I have included a map so you can see the distance you will be traveling. More information will be in the purple folder. Holy Idaho! I can't wait to find out about this new adventure. I hope I can get some sleep tonight. Geo and I sat down and looked at the political map Uncle GT sent us that shows the states and major cities in North America. There are maps for all sorts of things - the climate, natural resources, physical maps that show mountains, rivers and lakes, and many other types of maps. Take a look at the map I linked below. Geo and I finally found Phoenix and New York City on the map. Can you find the cities? The first thing Geo and I wanted to figure out was the cardinal direction we would be traveling. When we look at the cities on the map, New York is above Phoenix. So we are heading upwards on the map - which means we are heading to the northern part of America, because the top of the map usually represents the north. This map does not seem to show a compass rose to indicate where north is, so we will assume it is up. But we are also heading to the right. If up is north, then heading to the right, you are traveling east. So that means that New York City is northeast of Phoenix. Geo and I also wanted to figure out how far Phoenix is from New York City. Luckily, the map that Uncle GT sent to us also provides a map scale to measure the distance. The map scale shows the amount of map distance that represents 500-miles. Geo and I estimated that New York City is between 2,000 and 2,500 miles from Phoenix. Holy Idaho! That must be the farthest that we have traveled yet on any mission. I am glad that we are flying and not driving. We would have to drive for a few days to travel that many miles. New York City is located near the Atlantic Ocean. I am so excited because we have only ever seen the Pacific Ocean. The Atlantic Ocean is smaller than the Pacific, but I still can't wait to see the waves! Now we just have to make sure our annoying little sister, Pandora, doesn't find out! Pandora is 5-years younger than we are and always causes trouble for us. One time she secretly followed us on a mission for Uncle GT! Of course it was our fault (according to my parents) for allowing Pandora to read our journal. If she finds out we are heading to New York City, who knows what she might do to mess up this mission. We need your advice at the end of this post for how to trick her! BTW- I read today that Phoenix is the 5th largest city in the USA. I have lived here over 16-years and I didn't know we lived in such a popular area. Holy Idaho! Geo just told me something else about Phoenix. Did you know that we live in the most populated state capital in the entire United States? Wow, we must have a ton of people living in Phoenix! 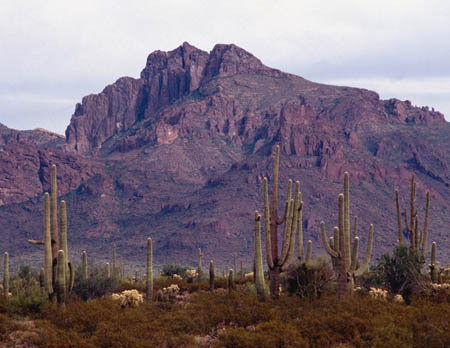 I have pasted some pictures of our home state (Arizona) into this journal. 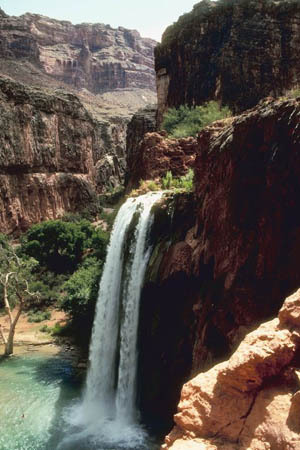 Here is a picture of a cascading waterfall at the Grand Canyon National Park - one of my favorites. Which way is north on this map? (Hint: there is no compass rose showing, so what is the assumed direction for north?) Can you find Phoenix and New York City on the map? Use your finger to trace the path in the air from Phoenix to New York. What cardinal direction is your finger moving? Can you find the scale on this map? - Should we try to tiptoe out the door before Pandora wakes up? - Should we tell Pandora we are doing a campout in the back yard, then sneak away? - Should we send Pandora a decoy text message on her cell phone?